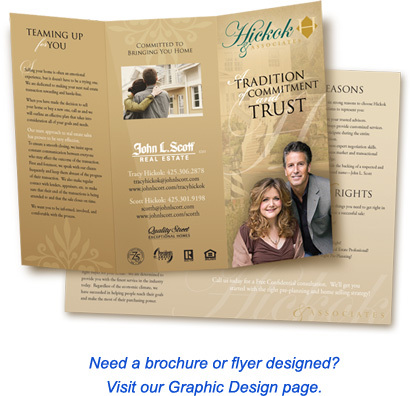 Full color brochures and flyer used to cost a fortune - but not anymore! With the development of digital color copying equipment, we can duplicate your full color brochures and flyers inexpensively on a variety of different papers, including cardstock. And you don't have to sacrifice quality. Our color printing rivals the quality associated with traditional offset printing. We do all the printing and bindery in-house to save you time and money. Or, if you need larger quantities, we can print 1000, 2000, 3000 and more! Just ask for a price estimate. Call us at 253-939-3812, or use our helpful online Quote Request form to get an estimate on your brochure or flyer project.